Cleanrooms provide an environment that has grown more important to manufacturing, especially as engineering has become more precise over time. The design of many products, equipment, and manufacturing parts require precision cutting and measurements to ensure perfect performance. Therefore, the environment these pieces are manufactured in needs to be highly controlled to make sure they flawlessly crafted. In this scenario, a cleanroom environment has incredibly low levels of pollutants (dust, microbes, chemical vapors, aerosol particles, etc.) per cubic meter. The number of allowable pollutants per cubic meter is how cleanrooms are typically classified, ranging from ISO 1 to ISO 9 (with ISO 9 essentially being standard room air). Overall, these rooms have multiple applications and in this post, we will go over some of their unique and often overlooked functions. A CMM room (or a coordinate measuring machine room) requires a controlled environment that is completely free of dust particles or other contaminants. This is because coordinate measuring machines are tasked with measuring the physical geometric characteristics of an object through the use of a probe that may be “mechanical, optical, laser, or white light.” The machine uses these probes to make contact with or bounce off of the object to measure its size and position with micrometer precision typically, because the machine is so precise, any type of dust or airborne particle landing on the object or moving through the air between the probe and the object, could completely throw off the measurement. Oftentimes, these machines are used in a manufacturing environment to test a part or assembly against the objects intended design. In the world of microelectronics, the code for production includes some of the strictest standards of environmental control of all manufacturing types. For microelectronics, there is an extremely small margin for error in their manufacturing process. Even the smallest imperfection due to pollutants could create a critical error in the end product. Because of the sensitivity of this product type, microelectronics are almost exclusively manufactured in a high-level cleanroom environment. The controlled level of contamination that a cleanroom provides allows for more standardized product manufacturing and fewer mistakes in the overall production process. The purpose and emphasis of pharmaceutical packaging is to keep the products away from any contamination whatsoever. The contamination of pharmaceutical products can happen in one of three ways: physical contamination which refers to the particles a cleanroom would protect you from, chemical contamination, and biological contamination. Although a cleanroom cannot prevent all of these contamination types by itself, it plays an important role in ensuring a Pharmaceutical company is doing whatever it takes to ensure the highest level of care possible is taken to ensure the safety of their products. In many cleanroom applications, a gown room will be required as a sort of buffer zone between the operating cleanroom and the outside. In most situations where a gown room is needed, it is because the type of work involved requires very strict contamination levels. The gown rooms are typically equipped with a sterile changing station for the employees and an “air shower” (Air showers are specialized enclosed antechambers which are incorporated as entryways of cleanrooms and other controlled environments to reduce particle contamination. Source: Wikipedia). With this gown room acting as a buffer, the actual classified cleanroom will be able to function under proper ISO specifications. 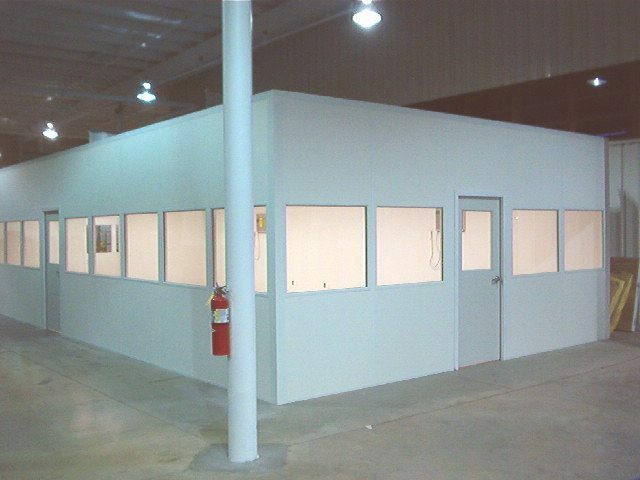 One of the most important aspects of a modular cleanroom is that they provide a consistent, quality controlled environment, a type of environment that can be repeated again and again. This is important to the manufacturing and cultivation of goods because it ensures a consistent quality of product. This same principle applies to cultivation and growing of sensitive plants or crops that require controlled conditions. These rooms provide the proper ventilation (the correct combination of carbon monoxide and oxygen) to provide the optimal growth rate of the crop. Plus, the rooms can be equipped with heat lamps in order to keep a constant, growth-friendly temperature for the plants. As a powder coating enclosure, cleanrooms play two larg e roles in improving the quality of service. 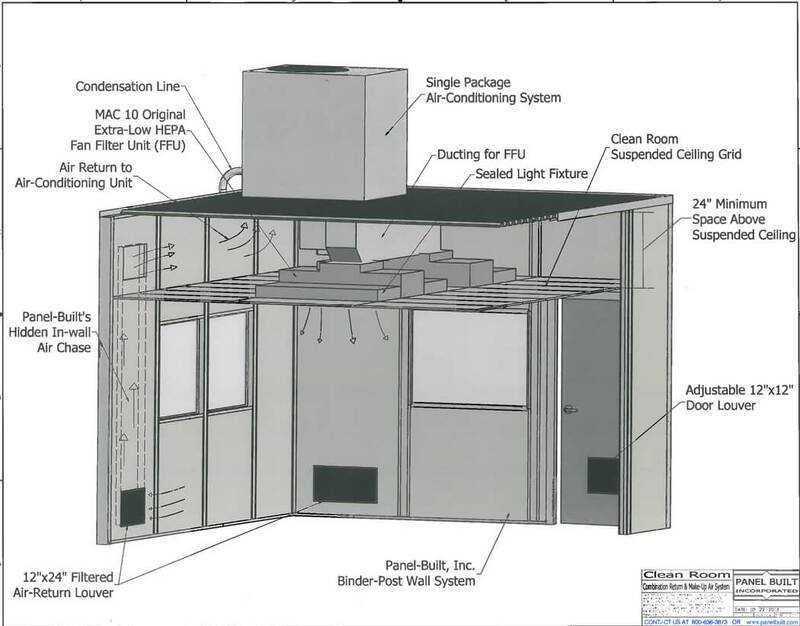 First, similar to our previous applications, the cleanroom will provide a consistent environment that will be low with pollutants and contamination. For powder coating, contaminants can become stuck between the powder coating and the material being powder coated, creating an uneven finish on the final product. Second, the cleanroom system can provide constant positive pressure on the enclosure, meaning there’s a constant influx of air into the room. This inflow of air keeps the powder coating particles inside the enclosure, keeping them from in contact with any items outside of the enclosure. Finally, a cleanroom provides the proper environmental controls to house a vivarium or an enclosure used for keeping plants and animals for observation or research. Vivariums can change a lot in shape and size due to their function. 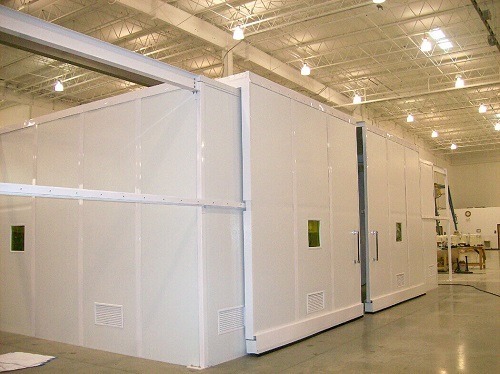 For our cleanroom application, your vivarium will typically be more large scale and scientific application. The main environmental controls that go into a vivarium will include the lighting, temperature, humidity, ventilation, and openings. All of these factors must be highly controlled and consistent for the vivarium to correctly operate. For instance, plants and animals from a tropical climate will be more accustomed to highly levels of light, temperature, and humidity than ones from a sub-arctic climate. Therefore, these variables in habitat must be taken into account when placed in a vivarium. Not only will a modular cleanroom allow you to keep these variables under control, it will also allow you to create an enclosure specially designed for your application.